Genre: Historical Drama/Romance. Release: 6 March 2009 (UK). Runtime: 104 minutes. Princess Alexandrina Victoria was born at the Kensington Palace on 24 May 1819. She was the only child of Edward (the 4th son of King George III) and Victoria Maria Louisa of Saxe-Coburg (the sister of King Leopold of the Belgians). George III had eight other sons; the eldest were: George, Frederick, and Williams. George was the Regent Prince; his only child Princess Charlotte died in 1817. Frederick married in 1791 and Williams married in 1818, but both had no offspring. He also had six daughters but also childless. When Victoria was just 8 months old, Edward died of pneumonia. Within a week, the sick king George III also died and the Regent Prince ascended the throne as George IV. Frederick died in 1827. When she was 11 years old, George IV died and Williams became Williams IV. As Williams was childless, the line of accession was passed to Victoria. The Parliament passed an act to establish a regency in the event when Williams died before Victoria became 18. Victoria's mother was over-protective and her comptroller and private secretary, Sir John Conroy, instituted a so-called Kensington system to protect the heiress. Victoria was not allowed to interact with other children and was always under a close watch. She was not even to walk without someone holding her hand and leading her up and down the stairs. She also shared a bedroom with her mother. At the urging of King Leopold, Prince Albert of Saxe-Coburg and Gotha travelled to England in 1836 to get acquainted with the young princess, his first cousin. Albert was 17 while Victoria just turned 17. Initially, she found find him dull but quickly liked him. In a letter she wrote to her uncle, King Leopold, she thanked him for introducing Albert to her and commented that "He possesses every quality that could be desired to render me perfectly happy." There was no engagement between the two and they did not see each other until after 3 years later. On 20 June 1837, William IV died of heart failure just when Victoria had her 18th birthday. So, Victoria became queen without the need to implement a regency. Victoria was crowned one year later on 28 June 1838. In 1839 Albert visited England again to bring the conclusion to this affair. During this visit, Victoria decided to marry him and informed her trusted Prime Minister, Lord Melbourne, of her decision. Albert was summoned to have an intimate interview with Victoria. They were married on 10 February 1840, and this happy marriage of admiration and love lasted to Albert's death at an age of 42 in 1861. In her long reign, there were at least six separate assassination attempts against Queen Victoria. The first occurred in June 1840, when an 18 year-old youngster held two pistols and shot at the carriage of Victoria and Albert. The two shots missed and there were no injuries to the royal couple. The film is directed by the Canadian Jean-Marc Vallée and produced by Graham King and others. It was first opened in London in March 2009 and received a mixed review. There were some critics about its historical inaccuracies, some of them allegedly from Queen Elizabeth II. For example, Prince Albert was not injured in the actual assassination attempt though the film had dramatized this incident by adding scenes about Albert suffering a serious shot wound. One can often see this kind of the discrepancies of history telling over facts in many other works, such as the historical plays of Shakespeare. In September, the film was showed in the Toronto International Film Festival at which Sarah Ferguson, Duchess of York, attended. In a TV interview, she mentioned that it took 15 years for her to plan and produce this film. Ferguson has an in-depth research of the life of Queen Victoria and Prince Albert. She commended the screen writer and the director on their outstanding work, and emphasized that the film tells a great love story. "The more I learned about Victoria and Albert, one fact became clearer and clearer: it was the greatest love story ever, two people who were first brought together for political reasons, but ultimately became truly and deeply devoted to each other." "In fact, I like to say that this is the most totally historically correct love story ever told." From this perspective, this film is a likable story of a young couple with the luxuriant environment of a ruling British monarch, and it should not be viewed as a documentary biography. In the film, Victoria (Emily Blunt) is portrayed as a deprived young woman under a demeaning ambitious Sir John Conroy (Mark Strong) and the domineering mother (Miranda Richardson). Under circumstances, she was pushed to the path of a great British monarch. Emily Blunt plays her role convincingly as a sweet worry-free princess blossoming to a strong-willed queen who could shape up her own future. Albert, as a charming minor prince from Germany courting the young Victoria and then starting to help Victoria in her royal duties, is also convincingly played by Rupert Friend. In short 100 minutes, the audience could enjoy the intrigue emotion and mood of the various conflicting personalities. The film also depicts the restriction, the power of politics and the dangers that intertwine with royalties. The film deserves a better rating and is rated here as 4 out of 5. Notes: Princess Beatrice played a very short non-speaking role as a lady-in-waiting at Victoria's coronation. The DVD version of the film is available now in Great Britain, and in the United States by December 2009. Amy Killin (August 22nd, 2009): "In observation, The Young Victoria does succeed in portraying a beautiful young woman trapped in the games of power hungry men, but fails to provide insight into the way the real Victoria fought for her countrymen and held her own in the royal court. After promising some grand things, the opening credits only serve as benchmarks for action that Fellowes and Vallèe could have hitor at least could have tried to incorporate into their adaptation of truly exciting real life events. As promising as this film began, the ending comes as sharply and as teasingly as the opening credits, offering a plethora of intriguing facts about Victoria, Albert and the life they shared with the English people, only to cut short. This is without ever showing any real dramatic action: The revolutionary virtues of the Queen, her influences in the advancements of education, welfare and industry were never expressed substantially more than as passing thoughts, and her rule of the monarch is really only shown as her ability to dodge hostile and gossipy conditions within the palace walls. While the gold here is mostly expressed through Victoria's disdain for cutthroat dalliances in politics and the royal power games played by all, her entrapment is cheesily evoked through imagery of iron window bars, heavy, locking gates and the exploitation of the game of chess as a constantly referenced metaphor for her own battles. Watching the chess scenes and one out of place, chess themed dream sequence, were like awaiting a train that was not comingaside from provoking intrigue surrounding the relationships within a plot line that went nowhere, they simply felt unnatural for Blunt and Friend. When Victoria finally breaks under the pressure of gossip and manipulation, Albert is the one subjected to her rage ­ and he is the one who only truly cares for her. For a film produced by Scorsese and the Duchess of York, Sarah Ferguson, it is easy to see who had a say in the way this film was made. Disappointingly, this film has replaced factual events with ones that have been fictionally "heightened", despite the fact that a more entertaining movie could probably have been made from a greater use of the source material in the first place. This film does score points for appropriate casting, and the beautiful location shooting gives this work a postcard-from-Buckingham-palace feel. Hopefully more attempts to tell the story of Queen Victoria will be made, because despite the conveyance of her world in this film, she did live an interesting and turbulent life." Wendy Ide (The Times, 5 March 2009): "While The Young Victoria could never be accused of being gripping entertainment, the relationship between the young Queen and her beloved Albert is persuasive and rather charming. 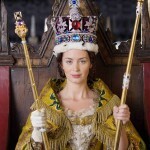 The rising star Emily Blunt plays the cloistered young monarch with a schoolgirlish playfulness and a lively spirit; Rupert Friend brings a poetic pallor and an endearing awkwardness to Albert. Together they capture the joy of two young people whose destinies have been preordained and whose decisions have been made for them, realising that their mutual regard is something all their own. When the characters are not being forced to recite chunks of scene-setting historical exposition there are a couple of highly enjoyable performances in the supporting cast. Mark Strong is a snarling pantomime villain as Victoria's mother's manipulative and ambitious advisor, Sir John Conroy; Jim Broadbent is hilariously raddled as Victoria's uncle, King William." Tim Robey (4 Mar 2009): "Blunt has a steely enough handle on Victoria; what's rarer in a female-centred period piece is for the male lead to be not just dashing in his tights, but emotionally commanding, and more than her equal. Friend, as Albert, is this film's secret weapon ­ ardent, subtly proud, a little shy, and a man with an intellectual philosophy he intends to preserve. The film glows as it gets to know him, and your resistance, like Victoria's, melts away." Peter Bradshaw (The Guardian,6 March 2009): "The story begins as the teenage beauty is bullied and sequestered by an overweening mother, the Duchess of Kent (Miranda Richardson), herself the mere puppet of an ambitious politician Sir John Conroy (Mark Strong). Forbidden even to walk up and down the stairs without a maid to hold her hand, Victoria must endure innumerable indignities until attaining her majority at the age of 18, and then afterwards assuming the throne on the death of William IV, a rousingly bewigged turn from Jim Broadbent. But monarchy is a lonely business. The friendship of a charming and worldly cynic Lord Melbourne (Paul Bettany) is not enough. Victoria is to find passionate love in the arms of Prince Albert, her young German cousin, played by Rupert Friend." "The awful truth is that there is something very, very unsexy in her sweetly uxorious relationship with Prince Albert. They were devoted to each other, of course, and how perfectly lovely for them. But it makes for a boring movie especially as, for an awful lot of the time, they are apart, in different countries, communicating with each other, and us, by letter. I longed for Blunt to throw propriety to the winds, grab Sir Robert Peel by the back of the neck, force him into a snog and then, once he is sexually enslaved and urgently stumbling out of his trousers, to drop-kick him out of the window with a maniacal laugh. But, oh no. This Victoria is more concerned with workers' housing conditions in the north, what with it being the industrial revolution and everything. And the bedroom scenes coyly show Victoria in a very long and unrevealing nightgown - the sort of thing Les Dawson used for drag scenes."